Overall very good condition. Owned by a collector. She is very close to original condition with any and all repairs attended to. Interior is in excellent condition and has been redone at some point in its life. Vessel has not been in water in years. Wood may be swelled. May need re-sealing. Stock #149676 Classic Chris Craft Supersport in Excellent Restored condition If you are in the market for an antique and classic boat, look no further than this 1965 Chris-Craft 21 Super Sport, just reduced to $21,499 (offers encouraged). 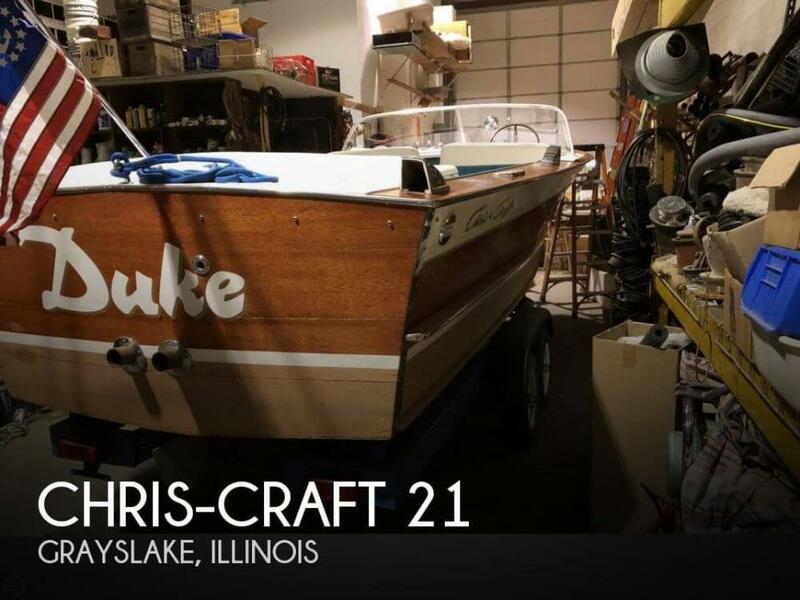 This boat is located in Grayslake, Illinois and is in decent condition. She is also equipped with a Chris-Craft engine that has 428 hours. Reason for selling is no longer using. 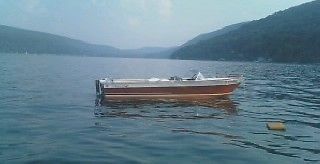 Antique Boat America is your Premier Broker for Antique & Classic boats. Buy a boat, sell your boat, or have us find you next classic! 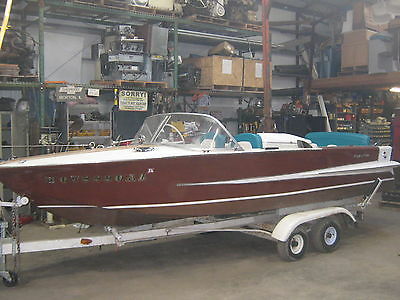 STOCK #29209 One of only 125 Super Sport 21' models built by Chris Craft between the years of 1964 and 1967. This example was completely restored in 2003. BIG BLOCK 427cid Chris Craft engine....if you are looking for a Super Sport, this is the version you want! 36 gallon fuel capacity, sharp turquoise & white interior vinyl, white vinyl decks with mahogany accents. Complete with a Load Rite tandem axle trailer, original manuals, and a cover. Would you like to call us directly? Inquiries on this boat may be directed to Mark Krzyzanowski by email at mark@antiqueboatamerica.com or direct line, 800-675-4089. Mark is a wooden boat lover and has been involved with the classics for over 20 years! We are located in the heart of the 1000 Islands, Clayton, NY; arguably one of the most popular wooden boat regions in North America. Home of the Antique Boat Museum, National Headquarters of the Antique & Classic Boat Society, and several world class restoration shops. 90 minutes North of the Syracuse, NY international airport, 90 minutes South of the Ottawa, ON international airport. 30 minutes North of the Watertown, NY airport. We encourage you to fly in and take a look at the boat with your own eyes! Offering free shuttle service to and from the Watertown airport! Let us help to arrange shipping, or keep the boat in our care until you are ready to pick it up. About Antique Boat America: Headquartered in Clayton, NY -Antique Boat America is your Premier Broker for Antique & Classic Boats. For the last 11 years, the company has provided a broad range of services to enthusiastic fans of wooden boats. 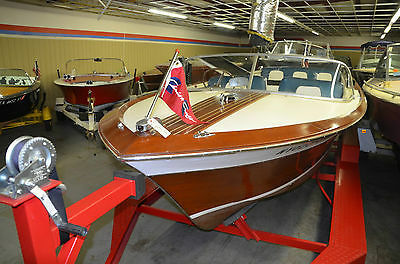 Antique Boat America offers over 1,800 boats for sale on its website. To date, 29 million visitors have viewed the new daily listings and the extensive inventory of boats built by Gar Wood, Chris Craft, Riva, Century, Lyman, Ditchburn, Greavette, Minett-Shields, and Hacker Craft. The company also offers shipping, surveying, brokerage, transport, analysis, evaluations, and also assists its clients in obtaining competitive insurance. For more information, visit www.antiqueboatamerica.com or call 800-675-4089. Antique Boat America is the world's LARGEST broker of Antique & Classic Boats Our Showroom: Located in the heart of the 1000 Islands Region, Clayton, New York. Our 20,000 square foot facility houses over 100 beautiful Antique & Classic boats, all offered for sale under one roof. Have you thought about financing your next classic? That's right: at Antique Boat America, you can buy, finance, and transport your next classic all in one place! We are proud to offer classic boat financing options through JJ Best Banc. Contact Mark Krzyzanowski: Mark@antiqueboatamerica.com or 800-675-4089 Talk to us today...Let's make a deal! Reference STOCK #29209 All that's missing is YOU in the Captain's chair! Call us now and let's deal on this great boat. We welcome pre-purchase inspection on every boat that we sell. We provide free pick up to and from the Watertown, NY Airport.Buyer is responsible for all shipping costs. We can help to arrange shipping worldwide at reasonable rates. These are pre-owned boats and sold as-is with no implied conditions or warranty. 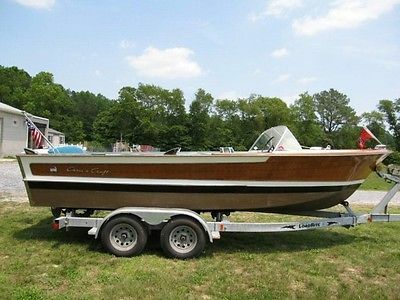 For Sale Reduced Price:1964 Chris Craft 21’ Super Sport with 430 CI Lincoln Continental engine. Rare (only 40 hulls of this model were produced). Only 550 engine hours. Second owners of this treasured family heirloom since 1968. Always dry-sailed, always stored indoors. Hoisted on crib in a dry boathouse on Skaneateles Lake from 1968 to 2004, when not in use. Beautiful mahogany, paint and upholstery. One major restoration, several minor ones. Added bilge blower and automatic bilge pump. Otherwise, 98% original or restored. Lights and gauges work, look great. Very fast boat, can run 50 MPH! Custom, loaded 2004 trailer. Dual axle, custom lofted to trailer bunkers, easy on/off, electric trailer brakes, launch guides, running lights, removable/pivoting trailer tongue, less than 200 miles on trailer. Have $5K invested in trailer alone. Comes with all the extras, lines, anchors, PFDs, cushions, skis and towline, canvass carport, extra trim gear, too numerous to mention. $9,000 for entire package or make offer.